Art gets personal in the sixth edition of Singapore Art Week, an annual celebration of visual arts which will be held from Jan 17 to 28. More than 100 events will transform museums and public spaces around the island in this festival organised by the National Arts Council, Singapore Tourism Board and Singapore Economic Development Board. Highlights include Artwalk Little India, where pedestrians can view new murals, listen to music and hear urban legends retold in the lanes around Serangoon Road. Galleries at Gillman Barracks in Lock Road will showcase new installations. Street artists will transform the ArtScience Museum and Aliwal Arts Centre. At National Gallery Singapore, viewers can put their stamp on an interactive installation by Thai artist Pinaree Sanpitak or receive a personal concert from an opera singer. Works from private collections are also out for public viewing in shows at the Singapore Chinese Cultural Centre in Straits Boulevard and through home visits for art collectors organised by art fair Art Stage Singapore. • Go to www.artweek.sg for the full listings of Singapore Art Week. Mr M. Govindasamy never expected his newsstand at 82 Serangoon Road to interest anyone apart from regular readers of the Tamil, Hindi and English magazines he imports from India. But to his delight, the nearly 40-year-old Siyamala Bookstore has inspired a mural commissioned for Artwalk Little India, a public art project presented by Lasalle College of the Arts and Singapore Tourism Board, with the support of the Little India Shopkeepers & Heritage Association. 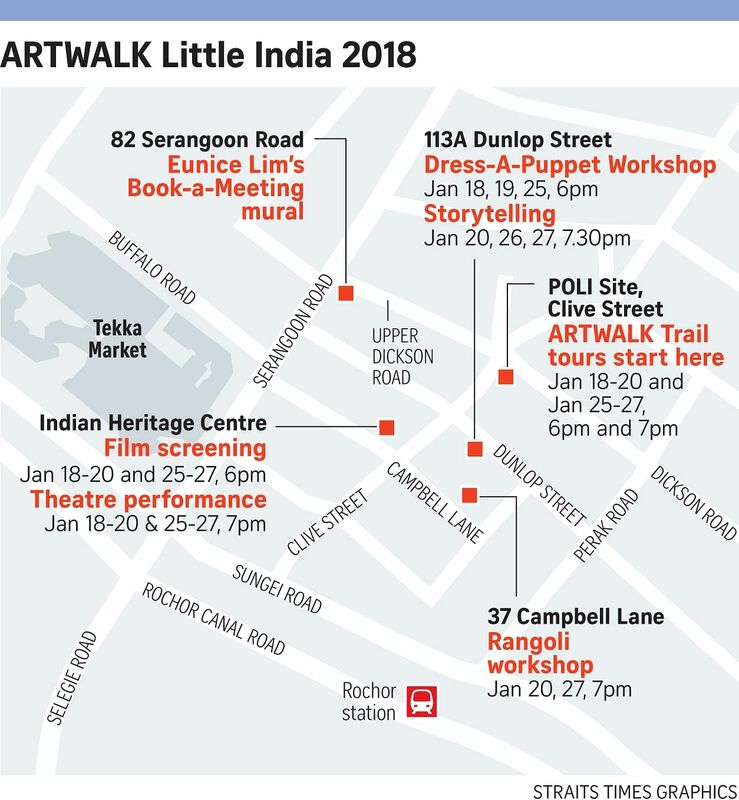 Artwalk Little India will be held from Jan 17 to 28 and is meant to bring to life the history and traditions of Little India, as well as the personal stories of its community. It was first held in 2015 as part of Singapore Art Week and last year featured 17 artworks which attracted 140,000 visitors. This year, it will have eight new murals at various locations in and around Serangoon Road. There will also be film screenings and performances of music and theatre at various locations. Walking tours will start from Clive Street. There will be workshops on yoga, making traditional puppets and the decorative art of rangoli. Storyteller Kamini Ramachandran will retell urban legends in a shophouse in Dunlop Street. The Indian Heritage Centre will host theatre piece The Mother Goddess by Ravindran Drama Group and screen K. Rajagopal's film, The Day I Lost My Shadow. Both are based on urban legends or the history of Little India. A committee of students from Lasalle organises and curates Artwalk Little India every year. Second-year arts management student Khairina Khalid, 22, is one of the organisers this year. She and her fellow students spent months getting to know shopkeepers and small-business owners before deciding on the programme. She says: "We wanted to do something with the community, not just go there and plonk our events in." Artist Eunice Lim, a graduate of Lasalle, created cattle-themed murals for Artwalk 2015 and last year. Working on murals for the Little India precinct changed her attitude to the area. "Before Artwalk, I had come to Little India maybe three times in my life. Now, I come 10 times a year for the food or to hang out," she says. She got friends and volunteers to interview the Tamil-speaking Mr Govindasamy several times before starting work on Book-a-Meeting, a 10m-long mural meant to look like an extension of his shop. Her mural features mash-ups from the covers of the magazines he stocks. She says: "It's interesting that he's been here for more than 30 years and will not change the contents of his store." Mr Govindasamy, 71, says through a translator: "People of my generation prefer books." The Singapore-born bookstore owner has two daughters and a son in India. They have no interest in continuing his trade. He says: "I'm very happy when young people come to talk and seek my advice. I feel a little emotional that at last I am getting recognised." During most of Singapore Art Week, the exterior of National Gallery Singapore will be transformed by multimedia projections by local artists and illustrators. Art Skins On Monuments is part of a larger urban art trail in the Civic District and Marina Bay programmed for the gallery's Light To Night Festival for the art week. Visitors in the gallery will enjoy intimate, interactive art experiences. In the basement, Thai artist Pinaree Sanpitak has placed 4,000 pillows with strings attached. Viewers can tie them together to make furniture or any creations they imagine. Berlin-based violinist Ayumi Paul will accompany their efforts to put their stamp on Pinaree's The House Is Crumbling, inspired by her own experience of redesigning her Bangkok house for the needs of her adult son and her ageing mother. Pinaree, who is 57 this year, says she is interested in how people interact in a shared space. "Also, for artwork, we're told not to touch the majority of it. When people realise they can, they become free." Interaction between past and present and different levels of society in Singapore inspires a work on the third floor, Singaporean artist and film-maker Ho Tzu Nyen's One Or Several Tigers. It is a 33-minute, dual-channel multimedia work which expands the story behind a 19th-century engraving of a British surveyor and several Indian labourers surprised in the jungle by a tiger while preparing for construction in the area. The work comments on colonialism past and present. The videos feature foreign workers invited by Ho to be part of the work, in period costume and also contemporary dress. When he invited them to view the finished work, most had returned to their countries after finishing their contracts in Singapore. On a more comforting note, from Jan 19 to mid-February, viewers roaming the gallery may be approached by opera singers and offered a personal concert of lieder, or art songs, composed by Franz Schubert. Sonic Blossom is the creation of New York-based Lee Mingwei, who has auditioned and selected 12 singers from Singapore aged 16 to over 60 to carry out the work. He loves the music of Schubert, which his mother played for him during his childhood in Taipei. In turn, when he cared for her after heart surgery some years ago, Schubert's lieder brought her comfort. Sonic Blossom has been performed at art spaces in South Korea, China, Japan, Australia and the United States. "The challenge is that sometimes people say no to the gift," says Lee, 54, but he adds that in all the museums in Asia, "only one person turned away the gift". A museum or gallery is the perfect setting for a song, he thinks. "A Rembrandt or a ceramic from the Song dynasty or this type of project, all bring beauty and grace to our lives." Singaporean artist Farizwan Fajari felt tremors of guilt while painting an SBS bus for the ArtScience Museum's upcoming exhibition of street art. "I knew we had permission to do this, but I was still nervous," says the 38-year-old, who signs his work as "Speak Cryptic". His nervousness stems from the odd space street art occupies in most cities. In Singapore, graffiti is illegal, even as more and more street art and wall murals are being commissioned by shops and the state. This tension between street art and institutions is explored in Art From The Streets, an exhibition at the ArtScience Museum from Jan 13 to June 3. Curated by Parisian gallerist Magda Danysz, Art From The Streets presents work from big-name artists Banksy and Obey (or Shepard Fairey). Eleven artists, including Speak Cryptic, Singapore-Australia duo Sheryo and Yok and Spain's Felipe Pantone, will also paint, stencil and build installations in the museum's nine gallery spaces on level three. Ms Honor Harger, executive director of ArtScience Museum, says the gallery walls will be spray-painted with aerosols and other paints. "Visitors will see a very different side of ArtScience Museum by the time we open." She adds: "What the exhibition really does is to show how street art has evolved from an edgy counter-cultural practice, often associated with vandalism and the objection and destruction of private property, to a major art form in the 21st century which is also recognised by both museums and galleries." Street art is an immediate response to space and time, so the artists The Straits Times spoke to had not yet decided what to do at the museum. Pantone, 32, said: "I still haven't finalised the sketch, even though I have looked carefully at the floor plans and 3D renderings. I always wait until I'm on-site to feel the space and come up with my best solution for it." Farizwan explains why there is no use making plans. He had initially planned to draw many more faces and figures on the bus, which will ply the streets till the middle of next month. Then when he began work, he realised the vehicle would often be glimpsed from afar and only for a short time. "You can't make out too many details," he said. He has created permanent murals for The Projector film space and Esplanade - Theatres on the Bay, but most of his commissions are temporary. He is excited about seeing street art collected in a space for almost five months. "That's longer than any other kind of street art, which is very transient. Hopefully, this exhibition will set up more conversations about public art. I would tell people, 'Go check out a Banksy because now it's guaranteed to be there. Go and see it and talk about it and decide whether it adds value to your life.'" Twelve galleries at Gillman Barracks are launching new exhibitions in time for Singapore Art Week. Three are solos from major Singaporean artists, including Dawn Ng, known for her giant inflatable rabbit installation Walter, seen around Singapore from 2010 to 2013; and Charles Lim (right), the first Singaporean to win an award at the Venice Film Festival in 2011. Photo and video artist Sarah Choo Jing, whose Art Of The Rehearsal media installation runs at the National Museum until Dec 10, also has a solo show opening at Yeo Workshop in Gillman Barracks on Jan 19. Lim, 44, also represented Singapore in the 2015 Venice Biennale with Sea State, part of a long series which explores Singapore's waterways, land use and relationship with the sea. His exhibition at Gillman Barracks, organised by Future Perfect gallery from Jan 17 to 28, is the final chapter of the project. Sea State 9: Proclamation looks at what Lim calls "the state magic ritual" of transforming sea into land. Aerial footage captured by drones off the western edge of Singapore shows dazzling seconds of sand being poured into the sea and segues into new construction on reclaimed land in Punggol. What interests Lim, a former national sailor, is that reclaimed land is still legally considered "sea" until geologists studying samples determine that the sand has settled enough. The president must then issue a proclamation that the "sea" is now "land" and part of Singapore. Lim has collected years' worth of proclamations, which will be exhibited alongside four videos. "It's like a state magic ritual. At this point, the sea becomes land. It's really interesting to me as a Singapore citizen that we don't know about this process," he says. Ng, 35, also offers a different view of Singapore through words, phrases and stories printed on sheets of paper 1.2m-long and 1m-wide. For her show, Perfect Stranger at Chan + Hori Contemporary, 48 sheets will be arranged on the floor for people to view like a tangible re-creation of a Pinterest board - or rather, revelations from popular secret-sharing app Whisper. Ng is not familiar with either, but is fine with the comparison. Each sheet is a response to a question posed by a child psychologist, who wanted to collaborate with her. The psychologist asked her one question a day for 365 days from June 2016 to the end of May last year. During that time, Ng gave birth to her first child and thought of the project as a "time capsule" of life in Singapore that she could share with her daughter some day. "It's about the little things in life, the fleeting thoughts and feelings. People always say they miss a person, time or place, but what they miss is a version of themselves. I was 'fossilising' a version of myself," she says. "It is my story, but I think most people can see parts of themselves." The eighth edition of this annual art fair is scheduled to feature nearly 100 regional and international galleries at press time. This year, the spotlight is on Thai artists and there is an exhibition of work for sale from Colombian figurative artist and sculptor Fernando Botero, whose bird sculpture stands outside Raffles Place MRT. Urban art collective RSCLS and artist Ryf Zaini create interactive street art in Make A Terrific Artwork Someday (M.A.T.A.S. ), a tongue-in-cheek commentary on the relevance of this art form. On Jan 20, RSCLS will host street art tours as part of the Aliwal Urban Art Festival. On that day, Aliwal Street will be closed to vehicular traffic for a giant street party. Indonesian and Singaporean artworks from two private collections are on display in this show from non-profit educational organisation Art Outreach. It is curated by artist and curator Kamiliah Bahdar. Look out for pieces by Singapore's Tang Da Wu and Cheong Soo Pieng and Indonesia's Popo Iskandar.